Ulaganayagan Kamal launches Vaaliba Raja's audio! Produced by H.Murali, Vaaliba Raja is being directed by Sai Gokul Ramnath. This film stars Santhanam, Sethu, Vishakha Singh and Nushrat Bharucha in lead roles and the music is scored by debutant Radhan. The audio of this Santhanam-Sethu starrer was launched today at Devi Cinemas. This film comprises of three songs all of which were played along with the visuals. The first song is a catchy and current number with lyrics that our youngsters can relate to, the song is titled 'Ennamo Pannura' and it is sung by Radhan, Rajan and Ramee. The second song is titled 'Nadu Kadalula' and it is written and sung by Gaana Bala. This song is a mix of lyrics from all the popular soup songs. The power of this number hits the roof as there is a special appearance by our very own Powerstar. The third song is 'Va Madhi Vadhana' a peppy dance number by Radhan, Mukesh and Blaaze. 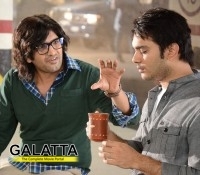 The main theme of the song is confusion that lingers around Sethu’s mind. This event truly was a star studded event. When we say star we mean THE star as Ulaganayagan Kamal Haasan himself launched the audio of the film. Other celebrities who attended the launch include K.V Anand, Gana Bala, Powerstar, Hemnath Babuji, Alagappan Prasad, J.K Rithish, Chithra Lakshman and Anbalaya Prabhakaran. >>Pop Singer Arjun croons for Valibaraja!